Fantasy fans everywhere have marked April 17 on their calendars as the premiere of HBO’s new television series, Game of Thrones. Promoted as the Sopranos set in Middle-earth, it is not surprising that this is one of the most highly anticipated shows of 2011. As such, it might benefit a person to keep an eye on the first editions of the fantasy series it is based on, George R. R. Martin’s A Song of Ice And Fire. The first book, entitled A Game of Thrones, was published by Bantam Spectra in 1996. It went on to win the Locus Award in 1997, with nominations for the Nebula and the World Fantasy Awards, as well. The first edition (with the silver foil jacket), currently commands an impressive $300 and upward from rare book dealers. (This blogger remembers buying several copies in the bargain bin at Barnes and Noble in 1999 for $5 each -- if only she’d bought a few more). A Game of Thrones was followed by A Clash of Kings in 1999, A Storm of Swords in 2001, and A Feast for Crows in 2005. A Feast for Crows was the first book in the series to debut on the New York Times bestseller list. And on Jan. 2, 2011, the paperback edition of A Game of Thrones hit the bestseller list, as well, thanks in no small part to the upcoming HBO adaptation. The first editions for the rest of the series currently sell at affordable prices. Decent copies can be had for under $50 -- though this may change after the HBO show premieres, or when the long-delayed fifth book in the series, A Dance with Dragons, is finally published. Other editions of the series to look out for: A Game of Thrones, A Clash of Kings, and A Storm of Swords have all been issued in special illustrated editions with limited print runs of 500 copies. They command hefty prices on the market, in particular A Game of Thrones, where the only copy currently online is priced at $2500. A Clash of Kings can be had for the comparatively modest price of $500, while A Storm of Swords is currently not for sale. As always, advanced reader’s copies are in demand, particularly for A Game of Thrones, which goes for $200 and up. On a final note, Martin’s earlier work in science fiction and horror can be found on the cheap. Collectors have zeroed in on the Song of Ice and Fire series in particular and so far have largely ignored Martin’s extensive back catalogue. Fantasy fans everywhere have marked April 17 on their calendars as the premiere of HBO's new television series, Game of Thrones. Promoted as the Sopranos set in Middle-earth, it is not surprising that this is one of the most highly anticipated shows of 2011. As such, it might benefit a person to keep an eye on the first editions of the fantasy series it is based on, George R. R. Martin's A Song of Ice And Fire. 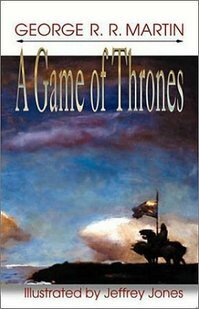 The first book, entitled A Game of Thrones, was published by Bantam Spectra in 1996. It went on to win the Locus Award in 1997, with nominations for the Nebula and the World Fantasy Awards, as well. The first edition (with the silver foil jacket), currently commands an impressive $300 and upward from rare book dealers. (This blogger remembers buying several copies in the bargain bin at Barnes and Noble in 1999 for $5 each -- if only she'd bought a few more). Other editions of the series to look out for: A Game of Thrones, A Clash of Kings, and A Storm of Swords have all been issued in special illustrated editions with limited print runs of 500 copies. They command hefty prices on the market, in particular A Game of Thrones, where the only copy currently online is priced at $2500. A Clash of Kings can be had for the comparatively modest price of $500, while A Storm of Swords is currently not for sale. As always, advanced reader's copies are in demand, particularly for A Game of Thrones, which goes for $200 and up. On a final note, Martin's earlier work in science fiction and horror can be found on the cheap. Collectors have zeroed in on the Song of Ice and Fire series in particular and so far have largely ignored Martin's extensive back catalogue.